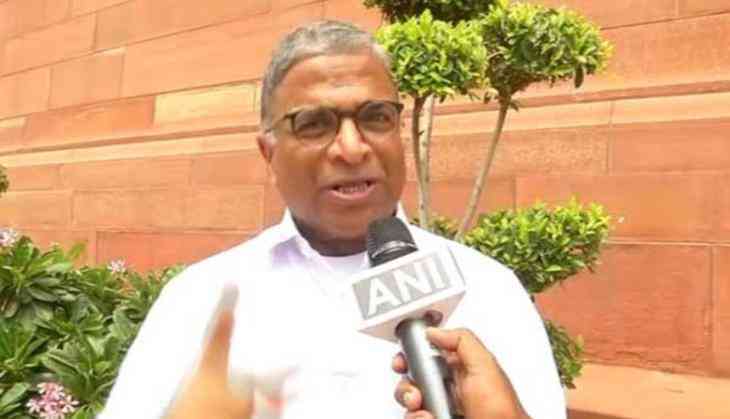 With six Congress MPs being suspended from the Lok Sabha for unruly behavior, Janata Dal (United) leader Harivansh on Tuesday asserted that suspension was not enough and that more stringent punishment is necessary. Speaking to ANI, JD (U) MP Harivansh said, "It is the most unfortunate incident that has happened in the Lok Sabha. MLA being suspended is a shame to the Congress Party. Also throwing paper at the Speaker and showing an unruly behavior is totally not accepted. Rather than having a good discussion the MLA's are behaving like kids. What example are they setting?". Requesting the Centre to take action on the MLAs, Harivansh stated that suspending the ministers will not do; government should take more disciplinary measures. "This incident shows that the Congress Party has lost its mind. Suspending them will not do.the government should take more disciplinary action on them," Harivansh said. Earlier in the day, Congress vice president Rahul Gandhi along and the rest of the Opposition, protested outside the Parliament at the Gandhi statue against the suspension of six Congress MPs by Lok Sabha Speaker yesterday. After the Lok Sabha witnessed uproar during the zero hour, Speaker Sumitra Mahajan yesterday suspended six Congress MPs for five days citing unruly behavior. The members threw pieces of paper and disrupted proceedings during zero hour when issues of mob lynching and Bofors scam were brought up.